Historians differ in opinion as to the nature of the first landing. Was it an expedition, or an attempt at an invasion? The reasons behind it are weak and although groundwork was carried out beforehand, the landing was, to say the least, badly executed. So for the sake of argument, the first landing is referred to here as an expedition. Like any Roman advance into foreign lands, the instigators give practical reasons for the attempt, but underneath there were always strong political and personal motives. It was well know in Roman times that an emperor could boost his standing and career by winning victories, or taking control of non Roman territory with a view to assimilating it into the empire. This instance was no different. Julius Caesar claimed that he had to invade Britain to prevent the Gauls, who were currently under Roman occupation and still hostile to their new masters, from receiving aid from their allies across the channel. The underlying motives were probably more personal and politically inclined. He had heard stories of Britain being wealthy in mineral deposits, especially silver and gold. He could also capture many natives to be sold as slaves in the Roman Empire. He had taken Gaul in a relatively short time and so imagined that Britain too would fall easily. His standing in Rome would have increased enormously had he managed to extend his province and added to the lands of the Roman Empire. Caesar had a special talent for influencing people. Today we call it 'charisma'. He was able to win most politicians over to his side. He had the ability to make others regard him as invincible, almost on a par with the Gods. Caesar knew this and exploited if to the full. By the time of the first expedition in 55 BC., Britain already had a healthy trading relationship with Europe and also Rome. Caesar had tried to gain information about the British tribes, their strengths and tactics and the nature of the coastline in general from the traders that traveled between Britain and Europe. These traders were suspicious of any motives the Romans had for asking these questions. Fearing that any information they may have given would have led to a situation that could damaged their livelihoods, many refused to cooperate or gave misleading information. They believed that if the Romans took control of Britain, their current level of trading would diminish. So it was in their own interests to avoid aiding the Romans. 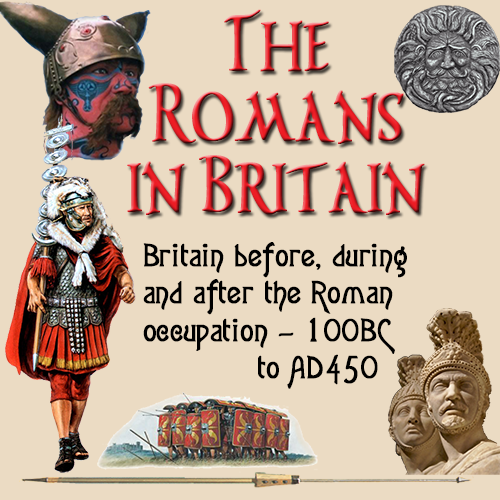 In fact, they relayed sightings of Roman movements back to Britain, so helping the natives to prepare for any incursions the Romans may make. Of all the Britons and those that inhabit the lands of the Cantii (Kent) are the most civilised and it is wholly a maritime region. These Cantii differ little from the Gauls in habits of life. But many of the inland Britons do not grow corn. They live on milk and flesh and are clothed in skins. All Britons stain their persons with a dye (woad) that produces a blue colour. This gives them a more terrible aspect in battle. They wear their hair long, shaving all the body except the head and upper lip. This was completely at odds with the Roman opinion of Britain, which was based on the goods traded between the two countries. Britain had exported a vast amount of supplies to Rome in the form clothing, which was of the highest standard and highly prized in Roman circles. In particular the British woolen cloak sagum was looked upon as a status symbol. The owner of such an item was considered to be in the height of fashion. Such was Caesar's influence, the Roman senate ignored their own thoughts, and took Caesar's writings as true and correct. There is another side to this. Caesar did not base his report on any personal visits to Britain. Everything he said was founded on feedback from traders and infiltrators who had crossed the channel and were giving their own accounts and opinions. It may be that they were trying to dissuade Caesar from invading by making him believe the country was not worth the bother. In any case many of those he consulted did not cooperate for fear of damaging their livelihoods. The planning of the initial crossing had been under way since 57 BC. Caesar was not a man to take the opinions of others lightly and because of this and the non cooperation he took his own action, Caesar sent a warship under the leadership of Gaius Volusenus to travel the length of the South East coast of Britain to find suitable beaches and safe harbours for a landing. This was meant to set the base for a full landing the following year. In this sense it failed in a big way. Volusenus sailed across the channel to the chalk cliffs and made his way north east along the coastline mapping everything he saw until he found a suitable beach. It was decided to make a landing on a flat beach and carry out a reconnaissance inland. Caesar had agreed with Volusenus to meet him at a given point off the coast within five days once the reconnaissance had been completed, the two met up and formed a plan of action. Caesar had an ally, Commius, who as the chief of the Gaulic Atrebates tribe in Europe to meet with the British Atrebates and offer a peace to avoid bloodshed in the expected battle. Commius failed in this task and was taken prisoner by the Britons. On 24th August 55 BC, the Roman fleet set sail for the English coast, with an estimated 10,000 troops made up of legions VII and X. By the following morning, the Roman fleet was at anchor of the cliffs of Foreland. The British were waiting and had amassed an army of warriors along the clifftops. By now Volusenus had met with Caesar and informed him of a better landing place further along between Walmer and Deal. It was here the Romans came ashore to be confronted by the Cantii, who had followed the Romans as they sailed along the coast. The Cantii were a large tribe split into four sections under the leadership of the chieftains Cingetorix, carnilios, Taximagolos and Segonax. The soldiers. oppressed with the great weight of their arms, ignorant of the ground, and with their hands encumbered, were obliged to jump from their ships to engage the enemy standing close to the waves. while on the other hand, either from dry land or having advanced a very little into the water, with all their limbs perfectly free, were boldly hurling javelins from places with which they were all aquatinted, and urging on horses inured into the surface. Finding my men dismayed, and disorganised by this accustomed manner of fighting, I ordered my long boats or galleys to be rowed a little distance from our transports, so as to attack the open flank of the enemy, and to dislodge them from their positions by slings and arrows and other missiles. This manoeuvre was of great service, for the British, confused by my artillery, stopped and drew back, though but for a little space. Leap forth, soldiers, unless you wish to betray your standard to the enemy. I, at any rate, shall have performed my duty to my country and my general. The standard was the prized possession of any legion and it was a disgrace to have it taken by an enemy. So the troops duly followed the standard bearer as he waded towards the beach. The British brought forth their chariots, which caused mayhem amongst the troops as they came ashore. On seeing this, Caesar took action by bringing into action all his reserve troops to support and aid the legions already ashore. It was not until late evening, about 7 PM. that the beach was taken by the Romans and the Britons pushed back. Thus they show in action the mobility of cavalry and the stability of infantry; and by daily use and practice they become so accomplished that they are ready to gallop their teams down the steepest slopes without loss of control, to check them and turn them in a moment, to run along the pole, stand on the yoke, and then, quick as lightning, to dart back to the chariot. By the fourth day of this landing, the sea conditions worsened to the extent that 18 transport ships carrying the cavalry approaching the coast were driven back by a violent storm. That same night there was en equinox, a regular tidal happening, which the Britons knew would happen, but failed to mention during the peace negotiations. Without warning the waves built up to a level where they rode up the beach and destroyed or damaged most of the landed ships. With great effort, the Romans managed to repair all but 12 of their ships. On seeing the Romans in such disarray and assuming their would be preoccupied, this the Britons mounted a fresh assault. They took the 7th Legion, who were out foraging, by surprise. With difficulty the Romans managed to escape. It was during this battle that the Romans experienced the unexpected. An enemy with battle tactics for which they had no counter. The Britons were using chariots and men on horseback. The Romans had been trained to fight ground troops, in a steady organised manner. So their weapons and tactics were of no use against the fast moving British chariots. The battle was fast and intense with the British warriors coming too fast from every angle for the Romans to handle. The Britons saw a real chance of success and sent out messages in all directions to muster reinforcements. Deprived of his cavalry, Caesar soon realised that his current force was outnumbered and outmaneuvered. Although the legions managed to fight off the British advance, they could not capitalise on their achievements and so they retreated back to the beach and held their positions. At the first sign the weather was improving the Romans sailed back to Gaul. Caesar's dispatch to the Senate must have made very interesting reading. Rather than admit to have been beaten by a foe with superior tactics given the circumstances, he was more likely to have reported that the weather and sea conditions had forced him to abandon the expedition and, of course, added a few embellishments of his own to make it seem like a victory. Whatever he reported, the Roman Senate was so impressed by Caesar's report, they ordered 20 days of thanksgiving. Needless to say, this enhanced Caesar's reputation and prestige. The inadequate preparation and the battle failures were either forgotten or misreported. Once again Caesar had managed to make a resounding defeat into a career boosting victory. This was even more than Caesar had expected and made him wonder if this vote of confidence had been influenced by his friends or his enemies. His friends could see a return visit and, with good weather, a great victory. His enemies would see it as a chance to dispatch him to foreign lands while they plotted against him. Before leaving for his annual winter judicial and administrative business in Gaul, Caesar left detailed instructions. These instructions were for his requirements for the next expedition planned for the following spring.